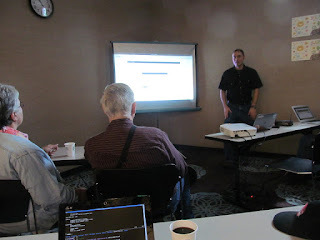 "Replace Your File Cabinet with Mayan EDMS"
We had a great turnout for our 8th meeting, where James Richey was kind enough talk to tell us everything he has learned about Mayan EDMS. James did a wonderful job explaining why we would want to use Mayan, how it manages documents, how to install Mayan and configure it. I neglected to take photos and screenshots as I was too busy trying to absorb as much information as I could. I only have one poorly exposed photo, which I've included. I will do my best to relate and capture what was presented. As usual, the presenter is the best source, so please forgive my inadequacies. James started the talk by discussing the various ways we can organize our documents. He was looking for something automated and computerized that provided personal control over his documents, made it easy to add new documents, and provided fast search for existing documents. James also wanted to avoid vendor lock in. He chose to invest time in Mayan because it is open source, free (as in cost), has good document organization features, will run on his personal server, and uses a simple file system based storage solution for the documents. That last feature mitigates the vendor lock in he is concerned about. Additionally, Mayan has a web based interface that can be operated by pretty much anything that has a browser, which makes it very accessible. Before attempting to deploy your Mayan instance, it is important to understand these concepts and to think about how to apply them to the documents that you need to manage. The document type is about classifying your documents. What are the sorts of documents you deal with? Some examples document types: receipts, bills, and manuals. Whatever sorts of documents that you find yourself managing, Mayan should be able to accommodate you. When configuring a new Mayan instance, James recommends setting up your metadata first, then your document types. That way you can flesh out the document types with the metadata as you create them. Once you have document types and metadata types, you'll probably want to have convenient ways of viewing and getting to the documents that you have Mayan managing. That's where the indexes come in to play. The indexes allow you to organize documents based on metadata values. For example, you could place all the documents related to project Phoenix in one index. The indexes are defined using Django templates. This means you have to understand both Django and Python to set up your indexes, which might be a bit of a learning curve for some. But it does give you a lot of power to create the indexes. I don't recall exactly where James discussed this, but Mayan has very useful search facilities besides the indexes. My notes say that you should be able to also search on the content (assuming Mayan understands the content of your documents). I haven't covered all the features that James discussed in his talk. I neglected to mention tags, revision tracking, and metadata validation. James has said that he finds Mayan very useful for his purposes, and he hasn't even started to try to use the more advanced features, like the REST API, smart links, and staging folders. He also mentioned that there is a FUSE (Filesystem in Userspace) view of Mayan indexes available. This could make Mayan accessible in situations where http can't be used. Mayan seems to have plenty of room to grow for people or organizations that need help organizing and managing their documents. Mayan EDMS is a Django application that would normally be installed on to a computer acting as a server. James has his instance installed inside of a "jail" running on his FreeBSD server. However, there are many ways to run Mayan including Linux "bare metal", virtual machines, or containers. 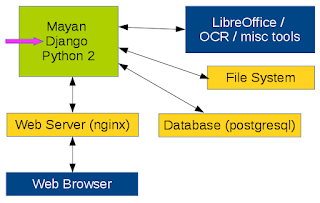 The basic requirements are a machine capable of running nginx, PostgreSQL, and Python. If you don't feel like running your own server, you can pay to have somebody else run the service for you. As usual in open source, you have lots of options. Diagram of the architecture of Mayan from James' slides. James gave a great overview of Mayan and the demo worked flawlessly. It's great to have a hands on demo after a presentation, since it gives us all a chance to try a few things out while the presenter is standing right there to handle questions. I know I learned a lot. We'd all like to thank James for taking the time and efforts to give such a great presentation on Mayan EDMS. And we'd like to thank Gresham’s Multnomah County Library for hosting us once again. We hope to see you next time! Until then, keep learning and sharing what you learn with others! 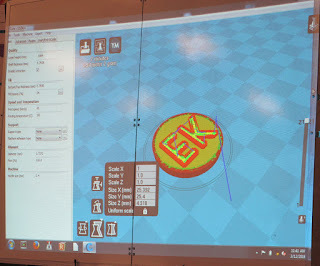 "The Joys and Sorrows of 3D Printing"
For our seventh meeting, EAST Knowledge was delighted to host Michael Yurkoski on the topic of 3D printing. Michael presented a little bit of the history of additive manufacturing, quickly dived into the practical details of hobbyist 3D printing, and finished off his presentation with a live 3D printing demo. The presentation was a terrific, densely packed performance, and I think even people who had been doing 3D printing for a while learned something new. With the usual apologies for not being able to do the speaker justice with our meager notes, we will do our best to provide an overview of what was presented. Michael's slides are here and also available at the bottom of the post, and we recommend you check them out for more information. 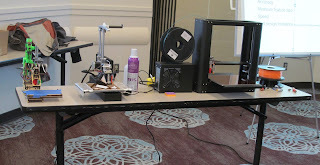 Besides Michael, other people brought their 3D printers to show as examples of the different options available. This was a great supplement to the main talk as it gave us in the audience a good appreciation for the variety of printers available even when they all use the same technology. From left to right: David's upgraded printer, Pat's Printrbot Simple (with print bed insulation), and Michael's Printrbot Plus. Michael started off the talk by contrasting subtractive manufacturing with additive manufacturing. Subtractive manufacturing is where you start with more material than you need and then remove material until you've made what you want. Examples are CNC mills, routers, cutters, etc. Most of what people think about when they think of modern industrial manufacturing is subtractive. Additive manufacturing is where you start with the raw material and build up a form a bit at a time. Industrial devices build up a form in layers. So you start with a design of an object, slice it into layers, and then build up the form a layer at a time. There are multiple technologies that can achieve this. See Michael's slides for the wide variety of 3D printer technology that is in use. There are at least two main advantages to additive manufacturing over subtractive manufacturing: less waste and the ability to create forms that are impossible (or at least much more difficult) with subtractive manufacturing. The first 3D printer that took digital design to reality was in 1984. These early machines would've been expensive. The first printer to break into the affordable hobbyist category was the RepRap. Steady progress has been made since then to the point that printers have become affordable and reliable enough that they are found in classrooms, offices, labs, and now in people's homes for their own personal use. Most hobbyist printers are of the material extrusion (fused deposition modeling) variety. Or as Michael says, they extrude noodles, little plastic noodles. 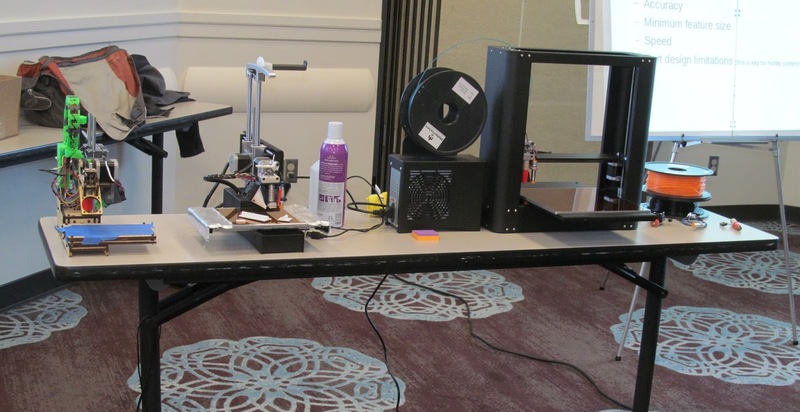 It is currently possible to get a decent 3D printer using this technology for around $500. The typical material used for printing is either PLA or ABS. PLA has the advantage of being biodegradable and fumeless. ABS can be stronger, but generally gives off fumes and is not biodegradable. While Michael has been successfully printing lots of objects, he emphasized that 3D printing is more complicated than just how the printer works. While the technology has improved and continues to become more economical all the time, 3D printing isn't yet at the stage where you can just hop on down to the local store, pick up a printer in your price rage, take it home, and start printing things you find online or that you design yourself. There are still many rough edges in the workflows and little standardization. For example, Michael often hand modifies the g-code produced by his tools (usually to adjust speed if I remember). Many of the tools also have all options that you may ever need exposed to the end user, which makes it difficult to learn and also makes it possible to select inappropriate combinations of options. Michael mentioned a tool that has an option labeled "fix horrible". He's not sure what it does, but he leaves it checked. However, watching Michael work, it is clear that 3D printing is definitely at the stage that diligence and attention to detail will pay off in the final products. If you have a 3D printer, the typical workflow would be to design an object using a CAD tool. At this stage you will need to think ahead about how you intend the object to be printed. You even need to take into consideration aspects of the slicer tool. If you don't want to design something, then you can take an existing design from somewhere else and start with it. After designing your object (or making a copy of an existing design), you import the object into a slicer program. This software is responsible for carving the object up into the layers we talked about before. It is also the tool that will allow you to decide how hollow your "solid" interiors will be. You can print your objects as mostly hollow with rigid support structures (see back lit photo below). You can also perform basic transformations in this tool. The slicer produces the g-code that is then fed to the printer. After finishing up the main talk, Michael connected his laptop to his printer. He started the warm up process on the print bed. Michael preparing for the demo with example prints in the foreground. 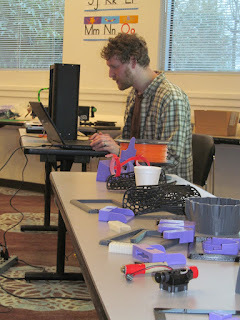 While waiting for the print bed to warm up, he demonstrated the slicer software to us. His plan was to print a small coin which, according to the slicer, was going to only take seven minutes to print. He showed off the various transformations and adjustments that can be made inside the slicer (e.g. flipping axes or scaling up or down). He pointed out that even if you initially lack skill or confidence for designing objects, you can still achieve a lot by using existing designs and making adjustments in the slicer. The EAST Knowledge coin shown in the slicer. Speaking of print beds, Michael talked to Pat about the modifications he had made to his printer. Pat had added insulation which he said allowed the print bed to warm up about ten times faster. Once the print bed was ready, Michael started the print. In the short video below, you can see a close up of the printer in action and hear the sounds it makes as it travels. You can also hear Michael and John talk about the quantity of plastic on the spool. As promised, the print job for the inch wide coin took about 7 minutes. Once it cooled, we had a nice new EAST Knowledge coin. The group got a kick out of passing around this newly manufactured piece. 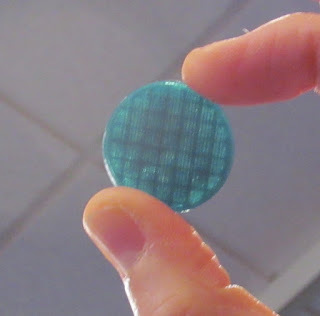 When you held it up to the light, you could see the support structures in the middle that allowed the coin to be hollow but still have rigidity. 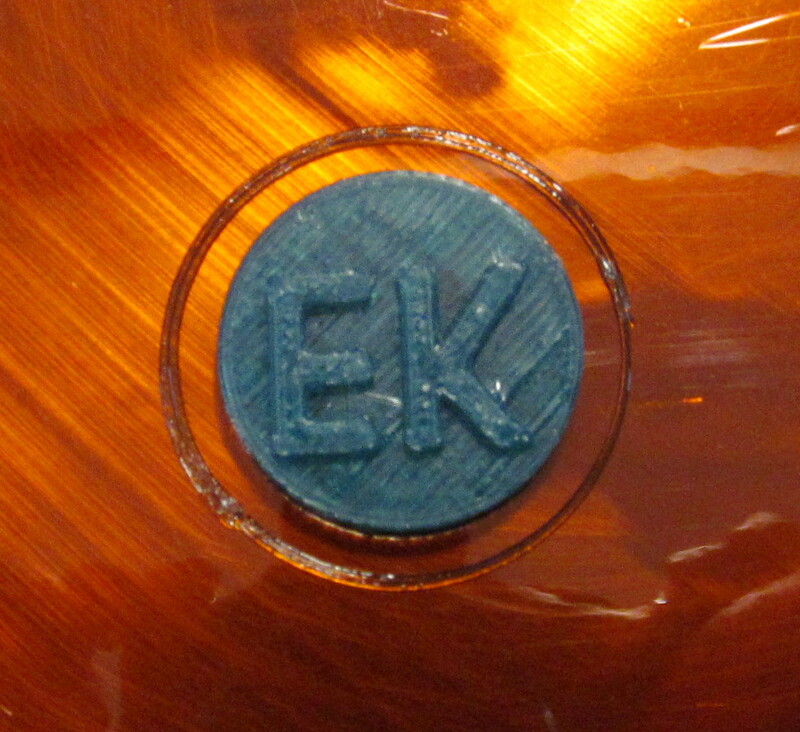 The freshly printed EAST Knowledge coin on the print bed. The ring around the coin is a skirt placed there by the slicer to help prime the extruder prior to starting the print job. Holding the coin up to the light to see the hollow interior crisscrossed with support structures. Michael packed a lot of information into his presentation and still managed to answer questions and run a successful demo. It was a lot of fun for the audience. We'd all like to thank Michael for taking the time and effort to present to the group. And we'd like to thank Gresham’s Multnomah County Library for hosting us once again. RepRap - "humanity's first general-purpose self-replicating manufacturing machine"